A complete boat can be yours, just put a group together and you are together with only your friends on a traditional wooden Gullet. Such a trip is also a good idea for clubs and other parties. From 10 persons onward we reserve a boat for you and suggest the best itinerary. Marc Anthony and Cleopatra vacationed here, and Anthony gave this region to Cleopatra as a wedding gift. Today's visitors enjoy exploring submerged Lycian ruins best viewed by private boat." On this cruise you are not going with the crowd. You are on board that you share with some other couples or single travellers, having your own crew that will be there for your needs. You may participate in sailing and have the chance to explore every little bay on your route. 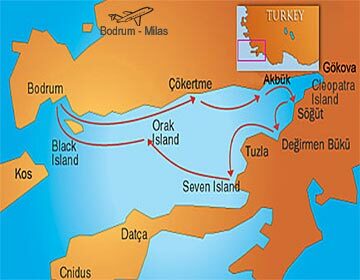 The major route of a BLUE CRUISE is this itinerary into the gulf of Gokova. This is where the whole idea of the Blue Cruise has started. We suggest first time travelers to try this balance of small coves, beautiful scenery and ancient ruins of the Cleopatra Island. Lots of swims in secluded beautiful bays and no big harbours, (the Gökova Gulf is a protected National resort) here are only 3-4 fishing hamlets. The next place that you should see when you arrive Bodrum is the landmark of the city 'Castle of Saint Peter' which has a history goes back to the Medieval Century and today it houses the world's largest and first underwater archaeology museum. One that you should not miss; is the 'Myndos Gate' where Alexander the Great had a hard time got into Halicarnassus. 3rd day: Cati Lagoon After breakfast we will travel leisurely to Catii Lagoon for lunch. The afternoon is yours to have an extended swim or visit the beauties of this region. Dinner and overnight in Cati. 4th day: English Harbour Cruise to Yediadalar for lunch. The surroundings are picturesque and ideal for swimming. You will anchor in English Harbor, a pine forest frame. The name English Port comes from the 2nd World War, as the ships of the English Navy were hiding here. In this area there are so many small and large bays for the boats to anchor. Dinner and overnight. 5th day: Cleopatra Island / Karacasogut Cruising to Sedir (Kedrae) island. This unique island with its small beach and unbelieveable clear water is like an open-air museum. You can see the amphi theatre, for 1500 guest capacity only. Cleopatra beach, that is located on this island has a very speacial kind of sand that can be found only in someplaces of Northern Africa. According to the myth Marc Antonius had brought this sand from Egypt by sea for Cleopatra. Then our boat will be sailing to Karacasogut village for the dinner and the night. This pretty small village is located 25 kms away from Marmaris. 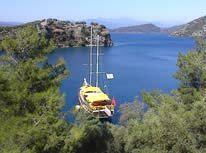 On request the captain will offer optional tours to Marmaris. Sailing to Pabuç after breakfast. Haremten bay is after lunch and svimming break. After breakfast, disembarking in Bodrum latest at 10.30. It is time to leave the boat with nice memories and say good bye to the crew . April 10. - May 27. Aug. 27. - September 16. Pls don't bring drinks on board. Don't just dream about a holiday sleeping on deck, under a velvet, star filled sky, listening to the sea lap at the hull below you...we can make it a reality for you. All tours which are offered here take place on Standard-Yachts, the traditional Bodrum-built GULET. All yachts are between 19 - 25 meters length, these vessels accommodate between 12 and 16 guests in 6 to 8 cabins. The cabins have en-suite WC & handheld showers. (Hot & cold). There is a music set, VHF Radiotelephone and a dinghy on each yacht, but in general no air condition. Crew consists of a captain, cook and a deckshand.